All a major fashion brand has to do these days is commission Steven Meisel to shoot its advertising campaigns and they’re golden. For proof, see Zara’s triumphant campaigns for the past two seasons. Meisel has already made a splash for Loewe, Coach, Moschino and Max Mara, and now returns for Zara’s Fall 2017 campaign. 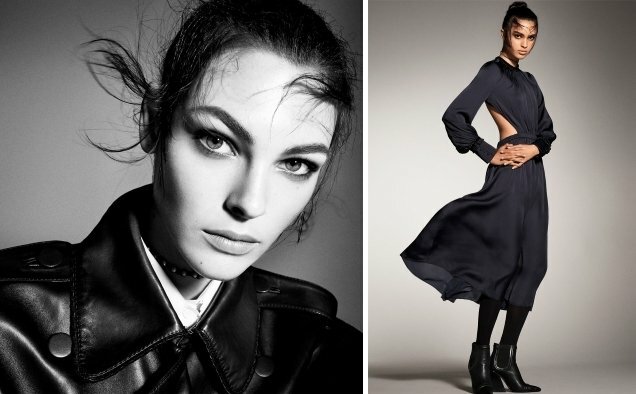 Models Grace Elizabeth, Vittoria Ceretti, Lex Herl, Aira Fereira and Faretta join Meisel in the studio to contribute to the wow factor of the classic and sophisticated images. Members of our forums wasted no time voicing their opinion. “The campaign is great. Meisel makes everything look so expensive. But the cast, as much as I love every girl here, should have been more diverse for a brand like Zara that has such a wide range of clients. Very happy for all the models who got it anyway, they all look flawless,” noted apple. “Last season was better but it’s still very nice. I’m beyond tired of Vittoria and Faretta though and I agree that there should have been more diversity. There’s only one very light skinned black model,” anlabe32 added. “Love this campaign. The clothes look good too,” proclaimed a delighted cocogirl. “God, Meisel makes Grace Elizabeth look completely amazing all the time. Looks like Zara is the new Prada (LOL). Although the images are less impressive this season compared to last,” stated Fiercification. “Man they just took that Dior collection and just ran with it huh. It’s a bit editorial-y but gorgeous pictures nonetheless,” approved Marc10. Check out Zara’s new Fall 2017 advertising campaign in full and share your opinion with us here.